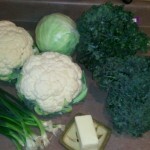 Paleo Diet Friendly Colcannon – Not Just for St. Patrick’s Day! Organic Garden Pea with Parmesan Soup Garnish with a thin slice of lemon or crumbled bacon. Servings: 10 2-16 ounce packages Organic Garden Peas 32 ounces chicken broth 1 onion — diced 2 celery ribs — sliced 1 cup parmesan cheese — grated salt and pepper — to taste 2 ounces butter In a stock pot over medium high heat, sauté the onion and celery in butter until soft.Add chicken broth and bring to a boil.Add frozen peas and return to a boil.Simmer 10 minutes.Remove from heat and puree well in blender with cheese.Adjust seasoning. Serve.